Sell-off in October, Just Seasonality? The U.S. stock market indexes lost 3.2-4.1% on Wednesday, retracing their months-long advances, as the recent downtrend accelerated following a breakdown below the medium-term support level. The S&P 500 index broke below the level of 2,800. It currently trades 5.3% below September the 21st record high of 2,940.91. The Dow Jones Industrial Average lost 3.2% and the Nasdaq Composite lost 4.1% yesterday. The nearest important level of resistance of the S&P 500 index is now at around 2,800, marked by the July-August local lows. The resistance level is also at 2,825-2,830, marked by August the 16th daily gap up of 2,827.95-2,831.44. On the other hand, a potential support level is at around 2,765, marked by July the 9th daily gap up of 2,764.41-2,768.51. The next support level is at 2,730-2,750, marked by some late June - early July fluctuations. Expectations before the opening of today's trading session are negative, because the index futures contracts trade between -0.7% and -0.9% vs. their yesterday's closing prices. The European stock market indexes have lost 1.5-1.6% so far. Investors will wait for some economic data announcements today: Initial Claims, Consumer Price Index at 8:30 a.m., Crude Oil Inventories at 11:00 a.m. The broad stock market will likely extend its yesterday's sell-off today, but we may see an attempt at bouncing off the mentioned support levels. There have been no confirmed positive signals so far. 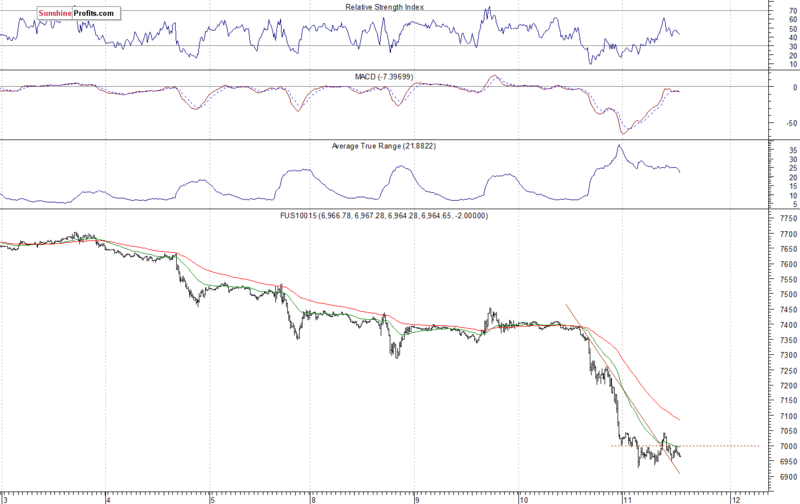 However, we can see some short-term oversold conditions. The S&P 500 index sold off sharply on Wednesday, following breaking down below its recent local lows. 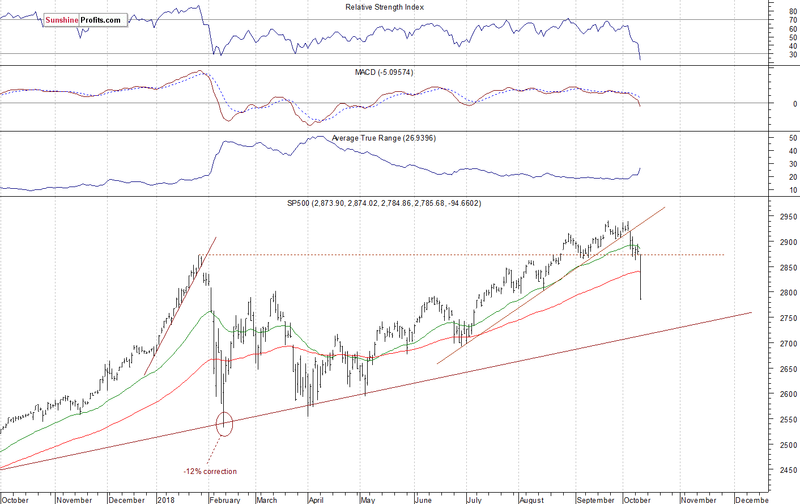 The market sharply reversed its medium-term uptrend yesterday. But will it continue much lower from here? We may see an attempt at bouncing off the mentioned medium-term support levels. There is the "October Effect" theory. It says that stocks tend to decline or crash during the month of October. Well, we can see a very sharp decline this month. So it is some kind of a stock seasonality pattern. Concluding, the S&P 500 index will probably open lower today. 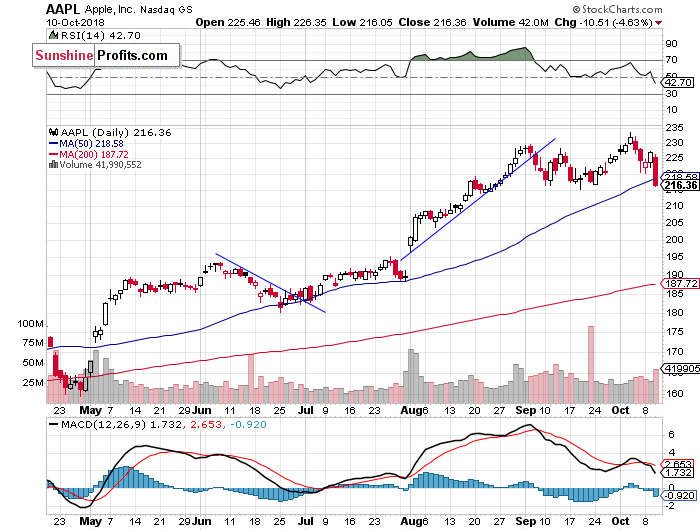 Then we may see attempts at bouncing off the support levels. But if the bulls fail, we may see more downward pressure and a move towards 2,700 mark. There have been no confirmed short-term positive signals so far. However, we can see some technical oversold conditions.